This article is provided courtesy of the U.S. Fish & Wildlife Service. A tightly-woven flock wheels in on the stiff breeze, circling once above the waves before alighting on the beach in droves: sanderlings in migration. The flock resolves into tiny grayish-white birds, whose spindly legs and long, stout bill are jet black, matching their eyes. They sprint along the water’s edge, racing after receding waves to probe the sand with their beaks—a few stabs here, a few there, seemingly at random—then retreat in a frenzied hustle before each successive pulse. They are like clockwork toys, remarked illustrator David Allen Sibley, dashing to and from the surf to feed with almost mechanical celerity. Sanderlings are the only sandpiper lacking a backward-pointing fourth toe, an adaptation thought to streamline its sprinter’s physique. They do run around an awful lot, chasing waves—and each other—up and down the shoreline. Because their quarry is small and all but indistinguishable beneath the sand, sanderlings must make several probes with each dash for even a soupçon of success. It is as if they are eating rice with chopsticks, a grain at a time—only the grains are buried inside miles of rice-sized sand. They tweeze the just-wetted beach because it is softer, and because the invertebrates themselves come up to feed in the wavebreak. The window of opportunity is narrow, indeed—a mere wave’s breadth of time. Sanderlings appear frenetic in their feeding simply because it is the only way to get enough to eat. Check out these common, comical birds on estuarine flats at low tide and all along our Pacific coast. The coast, in fact, is a major “staging area” of the sanderlings’ southbound migration route, where thousands convene on the sandy stretches to probe for baby razor clams and other invertebrate prey with characteristic rapidity. Think your life is hectic? Watch the sanderlings for a while—it’ll give you a fresh perspective. For the prime viewing opportunities along the Oregon coast, check out the various refuges and marshes, like Bandon Marsh National Wildlife Refuge or the Nestucca Bay National Wildlife Refuge. In winter months, these little birds are prolific on just about every stretch of beach, so it won’t be hard to find a spot to enjoy their busy antics. They breed in high Arctic tundra, and they nest directly on the ground, singly or in loose colonies. Their wintering range spans 100 degrees of latitude; on the Pacific coast, this encompasses beaches from British Columbia to southern Argentina. 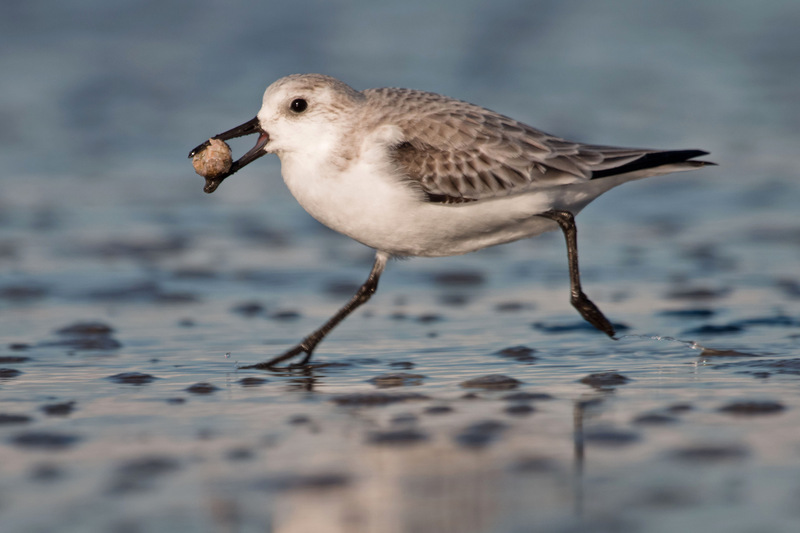 While wintering, sanderlings spend at least half of all waking hours foraging, running all the while. On the Oregon coast, sanderlings are preyed upon by merlins and peregrine falcons.